Right now, we only have a small quantity of berries ready for drying. Later, we'll have huge flats of screens out, but for now this is my favorite method and it works for just about anything you'd want to air-dry. Most everyone has some of these paper plate holders around the house. We rarely use paper plates, but the holders have become something that we use almost daily from the moment the first spring greens show up until the very end of autumn. The berries can be heaped on the plate to a thickness of about 1/2 inch. They will quickly dry down and separate, and I've never had any spoilage. The same can be said for most flowers or leaves. There is a lot of circulation, and open baskets are great for drying. After a couple of days the berries are starting to look like tiny raisins, and they will continue to dry for a week or more, depending on the temperature and humidity. When they have completely dried, keep them in a sealed container in a cool, dry place and you'll have plenty to get through the winter! We had a gully-washer last night, and a lot of branches broke. We didn't notice any problem on any of our trees around the house, and I was very relieved to not lose any elderberry branches. They usually are the first to go in high winds, being so heavily weighted by fruit. This evening my daughter and I wandered around the tree farm a little bit. We were about to go visit the puppies at my sister's when we came upon some mimosa branches that had come down in the storm. We quickly set to work and soon found that a basket was needed, so Molly ran down to the workshop while I continued working in the quickly dwindling light. The inner bark of mimosa feels so slick and emollient. The wood beneath is as white as bones. The bark came off easily in long straps, and we stuffed a large market basket with our treasure. The bark and flowers of the mimosa tree are both considered to be extremely helpful for grief and sadness, and I have personally found this to be true during several intense situations over the past few years. The easiest way to describe its action is to say that it pushes the gray clouds away and allows the mind to stop focusing entirely on the sadness. It is also a wonderful herb to have on hand for winter blahs or times when I just want to cheer up a little bit because life is too serious. In the past, I've dried the flowers, but they are very labor intensive and an overflowing basket dries down to a few cups of material. It takes weeks of harvesting (and a few bee stings) to obtain a 1/2 gallon jar. This year I didn't dry any, instead making tincture with the fresh flowers only. On the other hand, the bark dries beautifully and retains the components better and for a longer time. Every year I find a few small branches, but can't bring myself to cut a larger branch. Usually I wind up with a cup or so of dried bark. The bark is unusual in that the outer bark is almost paper thin (on branches - it's thick on the main trunks) and the inner bark is fairly thick. This will make a great addition to winter teas, and some of it will go into the jars of flower tincture that I started a couple of weeks ago. A few months ago, we received an extraordinary gift from The Rosemary House! Any herbie worth their salt has read something written by Bertha Reppert. 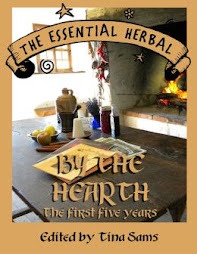 She was a prolific writer whose mission in life was to spread the love of herbs far and wide. Besides writing many books herself (many of which are still available at The Rosemary House), she was also quoted in many herb books and contributed many writings to various herbal newsletters around the globe. Prior to the advent of the internet, herb businesses were a completely different animal than what we've come to know. They were nearly all physical locations - stores, gardens, and classrooms with doors that people walked through. Marketing a business was an expensive proposition, and many herbal newsletters were published in order to stay in touch with customers and encourage visits and mail orders. Some newsletters were stand-alone businesses, but more often they were used as marketing tools. 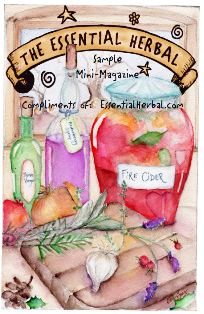 The herbal community enthusiastically provided content for these newsletters, contributing articles, recipes, and craft instructions in exchange for a way to also get their own names out there. Mrs. Reppert was a favorite contributor, and she also received copies of all those newsletters and saved them - all of them - for close to 30 years. So we were gifted with boxes and boxes of these herbal gems. For the most part, the businesses are gone, and in many cases so are the writers. The information varies from juicy tidbits to extraordinary revelations. The audiences were typically small, with between a few hundred to a thousand readers, so many of these items were seen by few people - most of whom have moved on in one way or another. We mulled this over for some time, trying to figure out how or *if* we could ethically enrich The Essential Herbal with any of this treasure trove. We've decided to try to contact writers whenever possible, and give full credit to any re-print, putting it under the banner "From the Vault". In the upcoming issue, you'll find an article on myrrh beads! 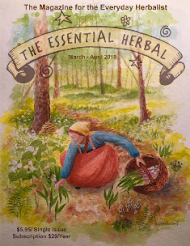 We're very excited about the opportunity to reclaim some of this herbal knowledge and expect that you'll find a little "something old" mixed in with all of our usual content that teaches and inspires, in just about every issue of our magazine for years to come. So far, this summer has been an interesting one here on the farm. For the most part, we are pretty well insulated from the very serious natural disasters that have hit so many parts of the country, but having so much contact with friends all over means that we are very aware of the bigger picture. It was very dry here, and the anxiety we felt as the patch of sweet corn languished and died was just a small taste of what our friends in the midwest are experiencing. The threat of brush fires was a constant reminder of the cauldrons to the west, and the weeks of high 90's and cloying humidity was still mild compared to many parts of the US. We've been lucky so far, and the storms over the past week have refilled our streams, reservoirs, and ground water levels. Right now the temperature is in the mid 60's (but that humidity is still with us...) so we're getting a break. All in all, we went about our business(es) and had a few adventures. We utilized the extreme heat to melt soaping fats and pounded out nearly 30 batches in the last month. Every time the shelves looked full, orders poured in and emptied them again - but that's the plan, isn't it? I've gotten to play with some different tinctures, like wild lettuce and lobelia, made a gallon of sour cherry "bounce" and our CSA share is keeping me busy trying new recipes and eating great foods. Beets, squash, cucumbers, kale and eggplant are big right now. Bob's potatoes and onions were harvested the other day and sit in crates down in the work barn. We got to meet our favorite big-city beekeeping gypsy and Renegade Farmer, Zan Asha last week, and it was fun to toss ideas back and forth. That was followed by a few days with my guy, and now we're looking forward to a little time with friends from the Big Apple. It's a good mix here. Although it might sound a little wild, everything falls into a lovely rhythm and we enjoy every bit of it. 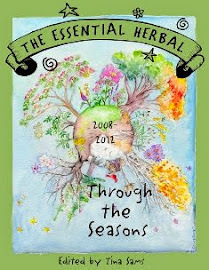 In the midst of this, the deadline for the Sept/Oct issue of The Essential Herbal arrived. I bundled up the well-stuffed file of articles and sent them on to Maryanne for lay-out. I was more than a little surprised to hear that it looked "light" to her after setting all the content, but then we realized that several of the articles were in a format that didn't carry over when she got started - and then realized that we'd need to use a smaller font and shrink the margins to get it all on the allotted pages. THAT'S more like it! There's a perfect blend of articles covering all aspects of herbal use - culinary, medicinal, growing, and enjoyment - and now if I can just get a focus for the field notes section, we'll be all set. It's hard to try to imagine what August and September will bring this year. We're in new territory and have never had a year like this one before. All I know for sure is that there will be a bumper crop of elderberries to process, and I'll be distilling lots of white sage from my own plants and there should be plenty fragrant leaves of rose geranium for the still as well. We'll keep on keeping on and hope for the best. In the Jul/Aug '12 issue of The Essential Herbal, Alicia Grosso provides a glorious bouquet of ways to use yarrow for the relief of summer's irritations. Here's one, excerpted from her article - simple to make, and very versatile. 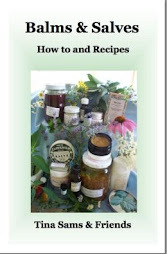 Make a mixture of dried botanicals. Three parts yarrow, one part lavender, one part rose petals, one part dry milk. Store a bulk amount in a dry jar with an airtight lid. Fill bags as needed and drop one into a warm bath. Alternatively, use the saturated bag as a small compress for sunburn. Gently swab tender areas. The climate and landscape of alternative care has been changing rapidly over the last couple of decades. In herbs, we've gone from a time when medicinal herbs were something we did for our families, to a full-blown industry, with all the elements (good and bad) that entails. Herbs, healthy eating, learning to manage stress, and a myriad of alternative preventive models have come to the forefront, allowing individuals to make a real difference in their own lives. In many cases, people have come to the study of herbs because they've learned to manage or even cure chronic illnesses that the allopathic medical community could not relieve. Even when we had our shop in the mid-90's, we listened to our customers who were disappointed in the care they'd received by doctors, hospitals, insurance companies, and drug companies. It is hard not to jump on the bandwagon sometimes, but throwing the baby out with the bath water is not the answer. I personally despise drug companies and insurance companies. They've clearly demonstrated that they will choose money over mankind (or any species, for that matter) every time, but talk to the parent of a child whose life depends on a medication, and it changes the dialogue. With the advent of heated discussions about funding insurance over the past 4 or 5 years, I've heard more and more herbalists saying that there is no place for the allopathic model. This is to me a childlike fanaticism. Charming, but foolish. The argument is that with proper prevention and care using herbs and lifestyle, there is no need for medical intervention. On the surface, I admit that this argument sounds good. We can control all kinds of diseases that typical Americans moderate with drugs. Lots of herbalists treat themselves and their clients for things like diabetes, high blood pressure, chronic liver disease, bacterial infections, cancer, you name it. The other day I saw several postings about treating dental abscesses at home. Nevermind that *anyone* can show up and declare themselves an herbalist - we'll leave that for another day. In fact, there are many, many things that can be successfully treated with alternatives, good choices, and proper education on how to use these modalities. The truth is, the average person "cherry-picks" from the options that would help, and doesn't have time (or inclination) to devote to learning all there is to learn about what is required. This can be like teaching a man to fish where there is no body of water. What they don't seem to be considering are all of the things that happen to people that cannot be healed with an herb or sutured up with some sinew in the backwoods. If I average it out, I'd say that I've seen a doctor about once every 5 years, and have been hospitalized about once every 10 years. I'm pretty healthy, and we use herbs for most any discomfort or self-limiting illness in this house. We try herbs first. There are things that no amount of herbal knowledge will help. An ectopic pregnancy in my 20's had one and only one lifesaving solution - surgery, stat. A couple of my siblings were involved in car accidents that would have left them disfigured and disabled without surgical intervention. A brother-in-law developed bacterial meningitis from a tooth abscess. An herbalist friend who treated her own high blood pressure suffered a debilitating stroke. A sibling with Hepatitis C was cleared of the virus through medical intervention. A sister-in-law born with a heart defect so severe that her parents were advised not to name her, is now 57 because of medical intervention. These are just people in my close little world. The list of things that herbs and diet cannot address is long. Do we choose to ignore them? In earlier times, it was fairly common for women to die in childbirth. Children born with congenital disease or malformations were doomed to live (or die) with them. People wandered around with puss-y sores and growths, poorly healed compound fractures, and all kinds of remnants of alternative healing, because that was the only thing that was available. So now, when I talk to someone who has embraced this model, saying they don't need doctors because they can cure everything (and just how do they get those things diagnosed? ), it makes me think about the damage they are doing to their brothers and sisters who work in herbs, and the legitimacy that so many have fought so long and hard to achieve. Showing up at the emergency room as a failed herbal experiment is exactly the sort of thing that brings the whole industry under scrutiny. This lack of responsibility that eventually falls back on allopathic medicine when it is too late to be of any help is how we lose options and access to herbs. There is an important place for all healing methods, and we would do well to remember that in order to keep what we have. Fanaticism blinds us to the value of that which we are not interested in seeing, but that doesn't mean that it isn't there.